Sophie Turner and Maisie Williams, who play Sansa and Arya Stark in the HBO series, got inked. 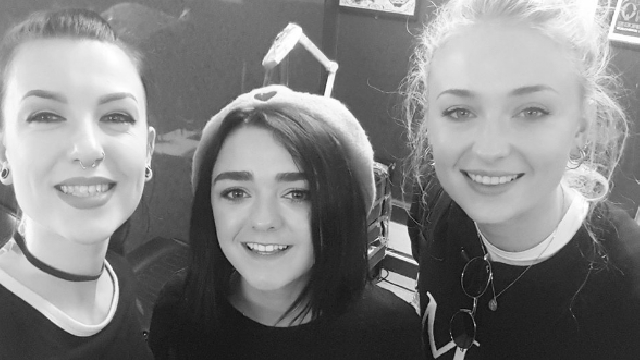 Game of Thrones stars Sophie Turner, 20, and Maisie Williams, 19—who play sisters Sansa and Arya Stark in the HBO series—visited a tattoo parlor in Belfast in Northern Ireland last September 13. Apparently, the HBO fantasy series is being filmed there. Turner and Williams dropped by Belfast City Skinworks and tapped tattoo artist Kat Paine to ink them. Paine shared a photo of herself with her two GoT clients on her Facebook page. "Although Paine didn't reveal the design of their new tattoos, she did confirm the actresses asked for matching ones," reports Us magazine. Entertainment Weekly also reports that "on the same day that they got their tattoos, Williams shared a photo of her napping on Turner’s shoulder with the caption '07.08.09,' leading many to suspect that they got matching date tattoos."